My brother is a Christmas baby, and the tradition has always been that my grandmother made him a yellow cake with chocolate frosting for his birthday celebration after Christmas dinner. A few years back, when my grandmother was no longer able to bake on her own, we started working on his cake together. And when she passed away, I took over the tradition completely. It has always been fun coming up with silly ideas or designs for his cake, usually themed around his interests at the time. 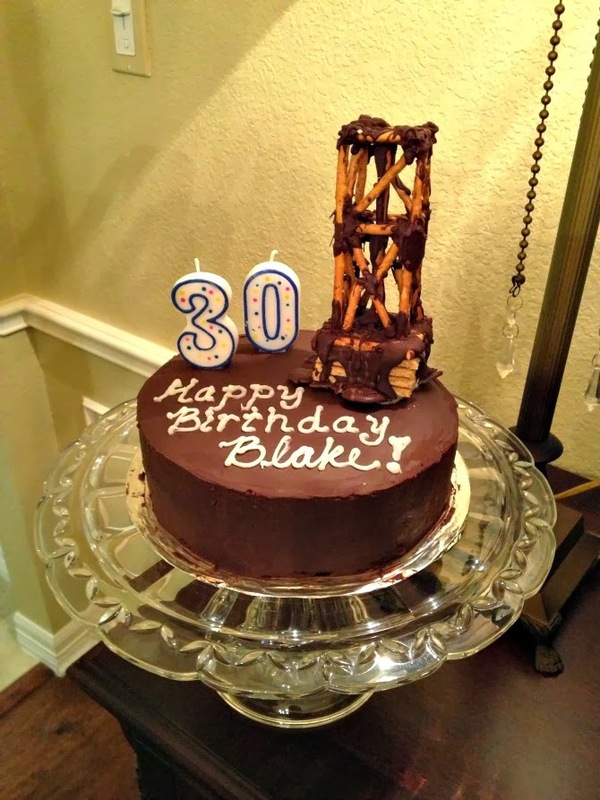 When it came time to start planning out his cake this year- I was really stumped. There weren't any new jobs or hobbies that came to mind. So I started to think about the things that he really likes- and St. Arnold's beer came to mind (specifically the Christmas Ale, so thoughtfully crafted for a Christmas birthday!) 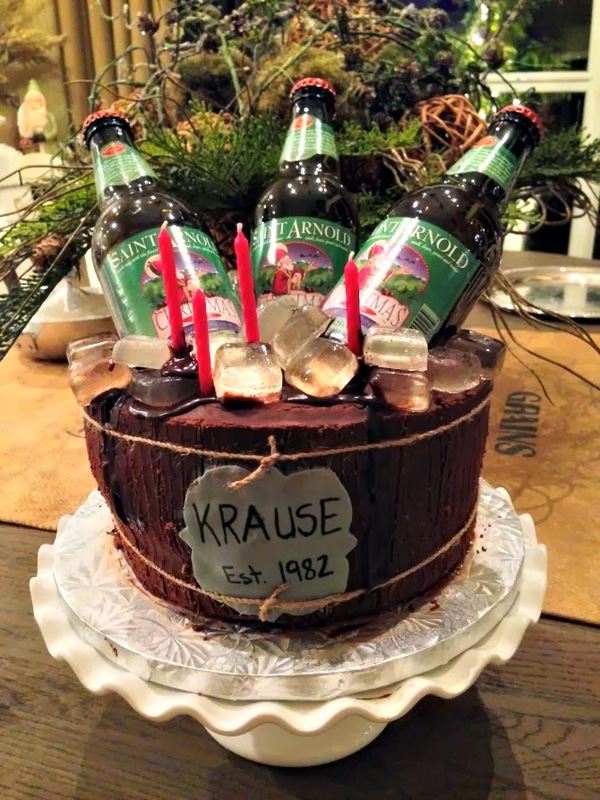 I did a google search for "beer cake", and came across all kinds of pictures of beer bucket cakes. Bingo!! Most of the cakes were covered in fondant (which I prefer to avoid), and they also contained edible ice cues (no clue how to make!!) So after some brainstorming and researching, I came up with a plan. I would make his traditional yellow cake, but use chocolate ganache for the frosting. It would dry firm, and hopefully allow me to make something that looks like a wooden beer bucket. I also ordered isomalt from amazon.com, and referenced this video for making sugar ice cubes. I was able to make the ice cubes a week ahead of time, but waited until the day before his birthday to bake and assemble the cake. Since I had to transport it to my parent's house, I waited until I got there to put the actual bottles on top. I also needed a few volunteers to drink the contents, and my dad and husband were happy to oblige. Once the bottles were emptied, I melted some extra ganache to pour in the hollowed out middle (I made the cake three layers to accommodate for carving out the top). I added the empty bottles, and then poured the ice cubes around it, using more ganache to make things stick. The cake might look difficult, but it was surprisingly easy compared to more time intensive cakes that I have worked on. But having said that, there are definitely some things I would do differently. While the ganache tasted great, I think the "beer bucket" part would have looked better if I had made actual panels out of the chocolate, and then glued them around the side of the cake with melted ganache. I also would have spent more time on the label for the bucket- it just didn't look authentic at all. All that really mattered though was that my brother was both surprised and happy with his special birthday cake. Seeing his face made it all worthwhile!